In early August, the first volunteers to Kenya returned from a mission project that included church and school construction, well drilling, and plenty of outreach. The work was focused in and around the city of Isiolo, in the central part of Kenya, at the Upper Hill Adventist Primary School and in the villages of the Samburu and Turkana tribes. At the school, volunteers constructed a new girls’ dormitory. The old building was in a terrible state of disrepair, with holes in the walls, cracks in the wall, and a dirt floor. The girls slept, sometimes four to a bunk bed, in the old space. The new dormitory has brick walls and a galvanized steel roof and frame. Volunteers also raised funds for new mattresses, blankets, pillows and storage trunks for the girls. In the villages, volunteers built One-Day Churches for two Adventist congregations in Larisoro and Chumbvieri. Previously, the congregations were worshipping under a tree. In Larisoro, Maranatha also drilled a water well and made a commitment to drill in Chumbvieri. The team also coordinated health education seminars and medical clinics at the various villages. The medical clinic saw more than 1,200 people over seven days. Next week, a second volunteer team will begin a project in the Meru region of Kenya, and more groups are scheduled to work in Kenya in 2017. 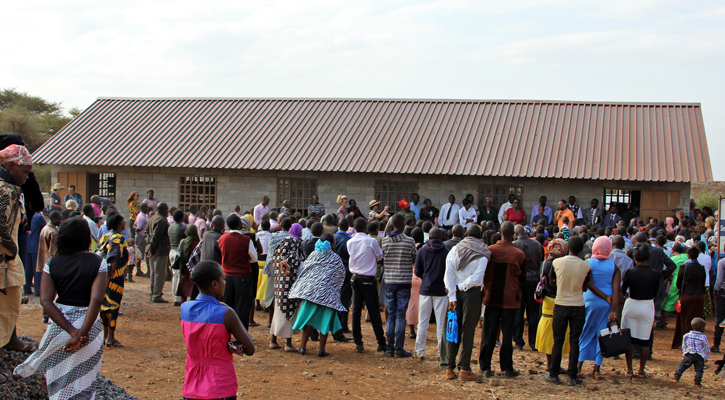 Maranatha is hoping to construct 75 One-Day Churches and 12 One-Day School classrooms in Kenya this year.